LOCATION.--Lat 41°50'42", long 74°32'22" referenced to North American Datum of 1983, Sullivan County, NY, Hydrologic Unit 02020007, on right bank 600 ft downstream from Red Brook, and 0.6 mi upstream from bridge on State Highway 55, in Grahamsville. PERIOD OF RECORD.--October 1938 to March 1987, October 1998 to current year. Monthly discharge only for some periods, published in WSP 1302. GAGE.--Water-stage recorder and crest-stage gage. 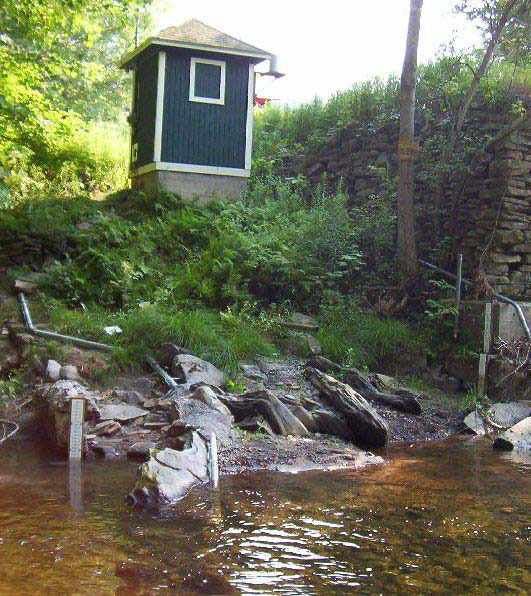 Datum of gage is 878.96 ft above NGVD of 1929 and 878.33 ft above NAVD of 1988 (VERTCON). Prior to October 1998, at datum 2.00 ft higher. Concrete control destroyed April 2005. REMARKS.--Slight seasonal regulation caused by Beaverdam Pond on Red Brook. EXTREMES FOR PERIOD OF RECORD.--Maximum discharge, 4,640 ft³/s, Oct. 15, 1955, gage height, 7.02 ft, present datum, from rating curve extended above 1,400 ft³/s on basis of slope-area measurement at gage height 6.68 ft, present datum; minimum discharge, 1.4 ft³/s, Nov. 1, 1964.